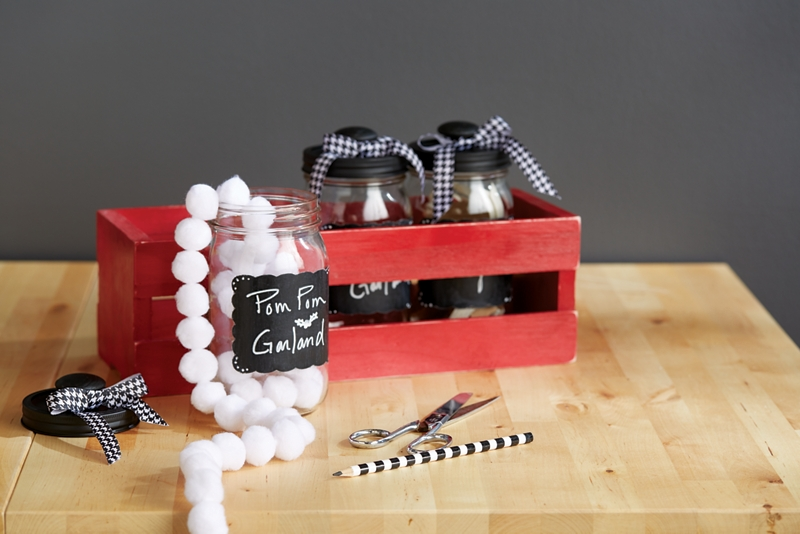 Transform a few Mason Jars and a wooden crate into the perfect storage for your craft supplies. With a strong adhesive such as E6000, adhere canning jar lids to inside of rings; allow to dry. Once dry, adhere knobs to center of lids. Spray paint lids and knobs with ColorMaster™ Satin Black. Using a personal die-machine and adhesive backed vinyl, cut three 3”x4” scalloped rectangles to use as stencils. Apply one stencil to smooth side of each jar. Mask all areas not to be sprayed with paper and tape. Spray paint jar labels with Chalkboard Paint, according to manufacturer’s instruction. Carefully remove vinyl stencil from Mason jar before last coat of paint is completely dried, to avoid peeling paint from glass. Condition chalkboard finish with chalk, according to manufacturer’s instruction. Lightly sand wooden crate until smooth. Spray paint entire box with ColorMaster™ Cherry Red; allow to dry. Lightly sand random edges of crate after paint is dry, to add an aged appearance. Cut ribbon into 2’ lengths; tie one piece to each knob. Trim away excess ribbon.